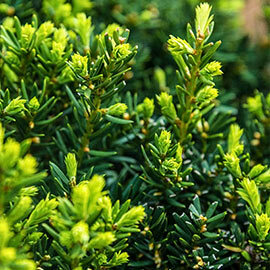 Foundation displays come alive with rich color and elegant form when you plant our Dark Green Spreader Yew. This low-growing, evergreen shrub features a lovely spreading habit that makes it an excellent choice for perking up the landscape—and it's now available in a handy gallon pot and ready for summer shipping. 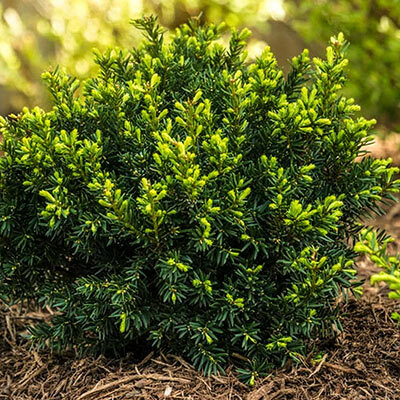 Reaches a mature height of 3-4 ft. with a 4-6 ft. spread, and produces an abundance of soft, dark green needles and a dense form, making it perfect for both foundation plantings and rock gardens. Grows best when planted in well-drained soil in full sun to partial shade. Potted. Zones 4-7. Depth: Dig a hole twice as deep and twice as wide as the container. Place the plant at the same level it was growing in the pot. Firm soil around the base of the plant and water thoroughly. 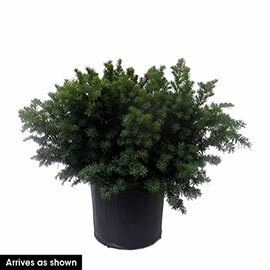 Foliage: Soft, dark green, evergreen needles. Pruning: Prune in early summer to maintain the desired shape.